Currently the competition among all fashion designers and brands is on its peak because of Eid. As all of us know that before Eid mostly ladies are very conscious about dresses and wants to dress up best on Eid and for this, these ladies or girls are wandering here and there to find the best outfit. In last 10 to 15 years the fashion designers entered in this field and making their own clothing which are totally unique and different from each other and prices as well. That’s why the reason the ladies and girls are confused which designer is best for them according to their range. Many designers in start of this month presented their Collection for Eid and they all got a good response from their loyal and regular customers. 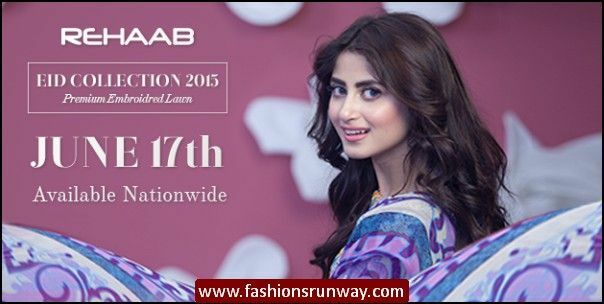 Same like Rehaab on 17th of this June also launched her stunning and beautiful collection of dresses through a leading best textile and manufacturer named as Jaffrani Textile and in within one week she also gained positive response especially from young girls. 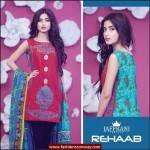 Jaffrani Textiles Rehaab Premium Embroidered Eid Collection 2015 is perfect for wearing on every occasion as these suits can be used as party, formal and semi wear. There are more than 13 dresses which are showcased by Rehaab which consist of 3 Pc complete suits as it includes printed or dyed trouser or pant, chiffon floral duppattas and shirts are embellished with innovative embroidery designing and back is made of digital prints plus laces and patches. 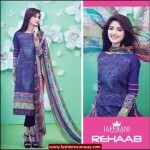 Rehaab Eid Collection 2015, this time used diverse theme in her dresses and color scheme are also not same like in one suit you can see many color added in it with different shades and pattern like red, blue, yellow and ferozi, purple, pink and royal blue etc. Rehaab Eid collection is now accessible inside big cities of Pakistan and those who live abroad can also purchase these suits by simply log on to this website. 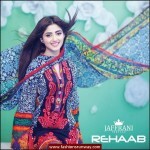 Check below here Jaffrani Textiles new embroidered premium lawn eid collection 2015 for women.